Horizontal Guide Bar for aliding weight. Ø Sump Tank : Capacity 60 Liters. The Set-up consists of a ½ bend and elbow, a sudden expansion & sudden contraction fitting from 15 mm to 25 mm, ball valve and gate valve. Pressure tapings are provided at inlet and outlet of these fittings under test. 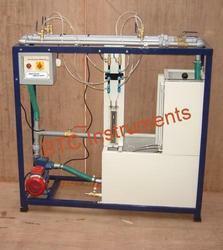 A differential manometer fitted in the line gives pressure loss of individual fitting. Present Set-up is self-contained water re-circulating unit, provided with a sump tank and a centrifugal pump etc. Ø Flow Measurement : Using Measuring Tank with Piezometer Capacity 25 Ltrs. A Pitot tube is used to measure the local velocity at a given point in the flow stress. A Pitot tube of standard design made of copper / SS is supplied and is fixed below Vernier scale. 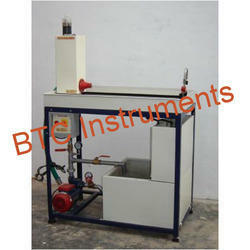 The Vernier scale is capable to measure the position of Pitot tube in transparent pipe section. The pipe has a flow control valve to regulate the flow. A U-tube manometer is provided to determine the velocity head. 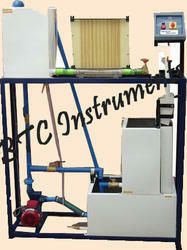 Present Set-up is self-contained water re-circulating unit, provided with a sump tank and a centrifugal pump etc. Flow control valve and by-pass valve are fitted in water line to conduct the experiment on different flow rates. 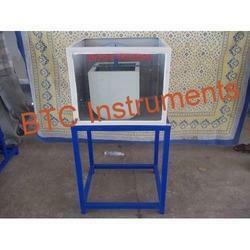 Flow rate of water is measured with the help of measuring tank and stop watch. Ø Flow Measurement : Using Measuring Tank, Capacity 40 Ltrs. Ø Sump Tank : Capacity 70 Ltrs. 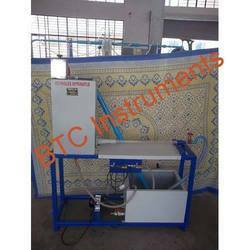 BTC Instruments Apparatus consists of supply and receiving chambers of 100mm dia and 600 mm long with gauge glass scale fitting for the measurement of total potential head. The two chambers are provided with control valves and are connected with an inter linking duct made of thick transparent prespex sheet of smooth variable converging-diverging cross section. The transparent duct has suitable pressure tappings, which are connected to glass piezometer tubes. These tubes are mounted on a suitable stand with graduated scales to read directly the potential head. The complete unit is supported on a strong iron stand. A stopwatch and an M.S. collecting tank of size 30 liters. Fitted with a gauge glass scale fitting, a drain valve and a bend is provided to measure the actual flow rate. 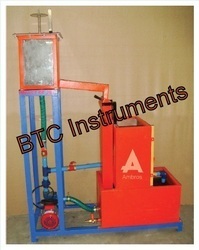 b) A 220 volt AC, 0.5 HP, single phase monoblock ISI pumpset with suitable pipe fittings, strainer foot valve, and switch is provided to supply water to the test rig. c) A sump tank of size 200 liters with suitable drain is provided to store the water. A strong iron stand fitted with wheels supports the complete test rig. The unit is moveable. From the first day of our inception, we have been able to manufacture and supply the best quality of Venturi Meter Apparatus. Known for its compact design, durable construction and optimum functionality, the offered venturi meter apparatus is rendered by us in various specifications. 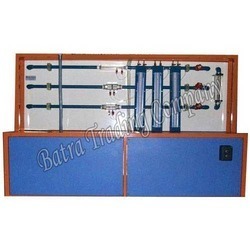 For fabricating the offered venturi meter apparatus in harmony with the industry laid norms, we make use of cutting-edge machinery. 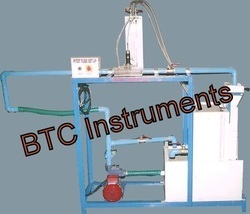 BTC Instruments maedUnit consists of self contained water recirculating unit provided with a sump tank, centrifugal pump and top tray to contain water drained from experiment. Set ups on to it and outlet to return it to the sump. Size of table 1500* 1200* 800 mm Measuring tank of 80 litres capacity Sump tank 150 litres capacity Centrifugal pump of 0.5 H.P Necessary piping, valves, fitting and stop watch Rigid fabricated MS frame structure for support Top tray , measuring tank and sump tank will be lined with fibre glass lining for corrosion prevention. f) Losses in pipes & fittings. Looking for FLUID MECHANICS ?